Preface. List of Contributors. FUNDAMENTALS. 1. Minerals and surfaces (J.A. Kitchener). 2. Adsorption (L.K. Koopal). 3. Interparticulate forces (R.M. Pashley). 4. Dispersions stability and dispersing agents (J.S. Laskowski and R.J. Pugh). 5. Static and dynamic contact angles (J. Ralston and G. Newcombe). 6. The influence of particle size and contact angle in flotation (J. Ralston). APPLICATIONS. 7. An introduction: physicochemical methods of separation (J.S. Laskowski). 8. Selective coagulation of colloidal mineral particles (R.J. Pugh). 9. Flocculation (Y.A. Attia). 10. Shear-flocculation (L.J. Warren). 11. Coating and carrier methods for enhancing magnetic and flotation separations (P. Parsonage). 12. Oil assisted fine particle processing (J.S. Laskowski). 13. Fundamental aspects of microbubble flotation processes (J.A. Solari and R.J. Gochin). Subject Index. 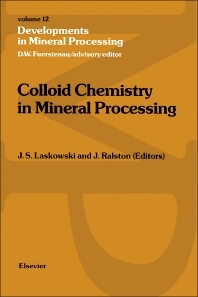 Within this volume is a thorough coverage of the fundamental principles embracing modern theories of colloid chemistry applied to mineral processing. It is written in respect for Dr. J.A. Kitchener, distinguished Reader in the Science of Mineral Processing in the Royal School of Mines, Imperial College, University of London (recently retired). Dr. Kitchener's expertise in colloid chemistry has led to numerous fundamental insights and practical advances in flotation, selective flocculation, and the treatment of slimes. Colloid chemistry is inevitably involved in all aspects of mineral processing, ranging from how collectors selectively adsorb on to mineral surfaces in flotation, to the forces which control the stability of dispersions of submicron particles, as well as embracing the behaviour of hydrolyzed metal ions in solid-water slurries. The intelligent use of this information is essential in the effective design of separation processes and strategies by the mineral processor. Up to date bibliographies are included at the end of each of the 13 chapters making this volume a useful general resource for researchers, students and mineral processors.